1 of 5 Pork. In a large ziptop bag, combine teriyaki sauce, garlic, lime juice and zest. Add pork and marinate in refrigerator for 2 hours. 2 of 5 Sauce. In a small bowl, combine chicken broth, teriyaki sauce, cornstarch, sugar and hot sauce. Set aside. 3 of 5 Vegetables. Remove pork from marinade and discard marinade. Cut pork into 1/2-inch slices. Heat 1 tablespoon oil in a large nonstick skillet over medium-high heat. 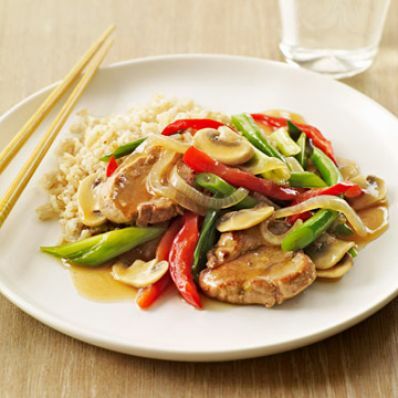 Stir-fry pork for 3 minutes. Remove from skillet and keep warm. 4 of 5 Add remaining tablespoon oil to skillet. Add onion and cook 4 minutes; stir in red pepper, mushrooms and scallions. Cook 3 minutes. Stir in the green beans, broth mixture and pork. Simmer for 2 minutes, until thickened. 5 of 5 Serve the pork over cooked brown rice.